Arched windows add a distinctive and impressive look to almost any home. These style adds beauty and sophistication to residences with its unique architectural value. They can become a focal point of a home and can greatly enhance the aesthetic value and upscale look of nearly any home. Arched windowshave a unique shape to them – unique from the standard square or rectangle. While most people think of an arched top in the shape of a rainbow with a flat bottom, there can be differences in the angle of the arch, the size of the arch, and the overall shape of the ellipse. They can be round, oval, semi-circle or can take on another geometrical shape. They can be installed on their own or in combination with other styles, come in a variety of sizes, materials and frames, and can include decorative options such as grilles, mullions and dividers. The sky is nearly the limit when it comes to designing a unique arched window to add character to your home! More on arched window prices. Other styles/shapes under the category of arched windows include: circle, octagon, pentagon, trapezoid, hexagon, chord windows, quarter circle, half circles, equal leg arched and round top windows. Truly the biggest advantage to any type of arched window is its distinctive look. These windows look great as standalone windows and can make a big aesthetic impact when combined with other styles. They come in a myriad of shapes and sizes, ranging from softly curved domes to sharp, angular designs. Arched windows look great on their own or they can provide an eye-catching focal point when dressed up with interesting window treatments. The windows can serve as a central design element in a room, and as an added bonus, they let in additional light. The biggest disadvantage to arched windows is the cost. 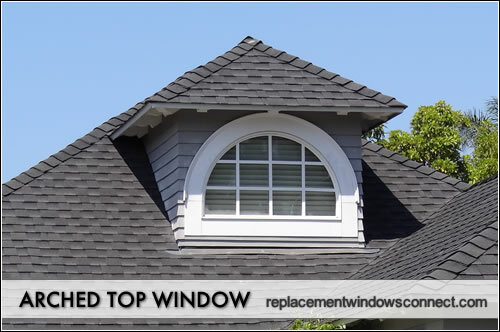 Since these windows do not come in standard shapes and sizes, they need to be custom ordered. This makes them a pricey option. The good news, however, is that one well-placed arched window goes a long way in enhancing a home’s design, so you don’t need to order more than one. Another factor driving up the cost is the installation of these custom windows. Replacing an arched window is a lot less costly than putting in a new one, since the unique shape is already cut out and ready for refitting. Another disadvantage is that they are typically fixed frames, so they’ll let in light but cannot be opened for ventilation.